We put out the annual call for Sandbar graduates recently-- Sandbar customers who have become regulars in the bar during their time at KU. Learn a little bit about Matt in today's post. Favorite: The Fresh Prince of Bel-Air Theme Song. It was a slow Saturday afternoon right after opening when my girlfriend and I brought in our puppy, a mini-dachshund (weiner dog), named Olive. The crowd was pretty small since the bar just opened, around five to ten people. The Bahama Mama with a chaser of Dirty Banana. However, the one I will always miss the most is the JERSEY SHORE. Bring it back! Well, it is time to move on…sort of. I will be close by in Kansas City working at The University of Kansas Hospital completing a PGY1 Pharmacy Residency. Gotta love the Sandbar! I will be bringing family and friends there this graduation weekend for tasty refreshments. Can’t wait. Congratulations, Matt! (And to Kylie and Olive, too.) We look forward to seeing you this weekend. We put out the annual call for Sandbar graduates recently-- Sandbar customers who have become regulars in the bar during their time at KU. Learn a little bit about Emily. What's your favorite Sandbar jukebox song? Everyone knows 90s music is my domain (which is why Sandbar is the best), but I'd have to go with Circle of Life. There's just something about hearing that tribal chant when you're a few (cough 10) drinks in! Which one do you never want to hear again? I actually don't recall ever hearing a song I haven't enjoyed! If anything, just no more Taylor Swift. When me and this other guy were doing a hurricane and he challenged me to a dance off on the bar. I think he was twerking at one point. He obliterated me! The one you'll miss the most? $2 Tuesdays and Refill Thursdays! Having everyone sing "I Want It That Way" is also like a religious experience, so I'll definitely miss that! Currently waiting to hear back from jobs in Boston and Baltimore, so hopefully I'll be heading out that way soon! But I will definitely be in Lawrence over the summer! I've never waited more than 30 minutes! I make sure to get there early to avoid any lines! I'm not an amateur! Thanks Sandbar and everyone there for all of the memories! Thanks, Emily! Good luck on the job front. Here's another Sandbar graduate who's sticking around for awhile. What's your favorite tropical drink? I love the Bermuda triangle, but you can't beat a Shark Attack! How many times have you danced on the bar? Only once, but I hope to make it many more this summer! What are your plans after graduation? After getting my Bachelor's this spring I plan on rocking my last two years of Pharmacy School! Tell us something else about yourself. I'm just a girl who can't pass up good drinks, good music, and good people. Also, I have plenty of pictures to back up all these special occasions. Good luck in pharmacy school! You'll need lots of drinks. Lots of our regulars graduated this year! Meet Hillary, who may have graduated but she's not leaving us just yet. What's the longest you've ever waited in line at the Sandbar? I always get there early enough so I don't have to wait! What's your favorite tropical drink? Bahama Mama- I collect the ducks! How many times have you danced on the bar? I don't dance on the bar- I dance on the window between the back room and the main bar. What's your favorite or funniest memory from the Sandbar? My favorite memory is definitely the first time I went on my 21st! We look forward to partying with you another year! Here's another member of the Sandbar Class of 2013, courtesy of Katie, who submitted profiles of all her friends. Sandbar Graduate Profile: Alissa A. What's your favorite tropical drink? Afternoon Delight!! What are your plans after graduation? After grad, I'm going to Texas for the summer and then going to grad school at Oklahoma! Good luck in grad school, Alissa! Even though you're going to Oklahoma and not staying here. Be sure to let us know if you find a cool bar down there! Graduation might be a distant memory for the class of 2013, but we're still happy to tell you about some of our customers. The very helpful Katie sent us not only her own answers to our questions, but answers for several of her friends, also. What's the longest you've ever waited in line at the Sandbar? I waited an hour and a half for bar band once, spent 45 minutes of that time at the front of the line, but it was worth it. What's your favorite or funniest memory from the Sandbar? I ended my 21st birthday at Sandbar, and that was pretty great. However, I also enjoyed seeing Big Wave Dave break out the Harlem Shake at the last Bar Band of the season this year. Making the two mile walk during the snowstorm this year to get to Sandbar also goes on the list. What are your plans after graduation? Living in Lawrence for one last summer of freedom and then off to Australia for a year as an Au Pair! Thanks, Katie! Make sure you take a Sandbar shirt to Australia, and maybe you'll run into one of our other 2013 graduates, Dr. Emmie! What's with everybody going to Australia all of a sudden?! For the past three days, we've been featuring friends and customers who are graduating this spring. Today's entry is from Nicole, who along with yesterday's guest blogger, Andrea, has been a fixture in the bar on Thursday nights. My favorite jukebox song is either "it wans't me" by Shaggy or "Wannabe" by Spice Girls. The longest I've had to wait in line was probably 45 minutes. My favorite tropical drink is Dinomite! I've danced on the bar too many times to count! My favorite memory of The Sandbar is either typical Thursday or being there this semester for the snow days. My plans after graduation are to move to Overland Park for a customer service job at Philadelphia Insurance. Nicole didn't send us any pictures, but you can check out her roommate's submission; she's probably in one of those photos. Thanks, Nicole, and congratulations! Every #typicalthursday! Me and Nicole only missed one all year! And also taking my best friend that goes to Mizzou (ew) to show her the best bar in Lawrence! I am graduating with a degree in Sport Management, and interning with FC Kansas City and Kansas City Comets soccer teams. Sweet Caroline – because there’s nothing more enjoyable than a big group sing-a-long that involves a mid-chorus BAH-BAH-BAH! And also, because good times never felt so good. Melon balls – deeelicious Midori. And of course, any drink that comes with a mustache. Right before I got to dance on the bar for the second time, we were waiting for the guys to get the costumes out and such, my friends and I had a drunken fish-face contest with the fish at the back of the bar. Needless to say – the humans won the most ridiculous face. We later capped those funny faces off with stick-on mustaches. More school more school, escape reality! I’m headed to study at another Sandbar – the beach in southern Australian! In the fall I move to Geelong, Victoria for another doctorate. Then I’ll be a Doctor Doctor and my life will be one step closer to the scene in “Spies Like Us." I stumbled into the Sandbar for the first time as a hasher – a member of the Hash House Harriers. Better known as the drinking club with a running problem. 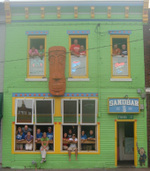 The hashers have introduced me to a lot of great places and great bars, so Sandbar has great hashing memories for me. I also like puppies, rainbows, and long walks on the beach. I’m sending along photos – I am pictured in the beautiful blue mermaid outfit. Pretty much the best dressed at the bar. Great memories!